The pathway to learning is a long, winding road with many turns, peaks, and valleys. There is no one “right way” to learn, and regardless of our methods of acquiring knowledge, what matters most is having acquired that knowledge. For many of us, there are a litany of family members, teachers, and mentors who have helped educate us. When it comes to solving complex problems, we’ve learned over time that the best way to tackle those problems is to simplify them. While we’ve all had some fantastic educators, it should come as no surprise that the middle-aged founders of 46brooklyn gleaned a fair amount of education staring at a television screen. While the soothing voice of Mr. Rogers and the unpredictable adventures of Captain Kangaroo were big components of that early childhood education, it was Sesame Street that helped mold our young minds before professional wrestling and video games reduced them to rubble. This year, with Sesame Street celebrating its 50th anniversary, there are some old lessons that remain tried and true to this day. It was Sesame Street that taught us to add and subtract, to work outside our comfort zones, to be open-minded, to embrace the unknown, and to always share. With this in mind, in today’s episode of 46brooklyn, we’d like to take you on a drug pricing adventure of national proportions. 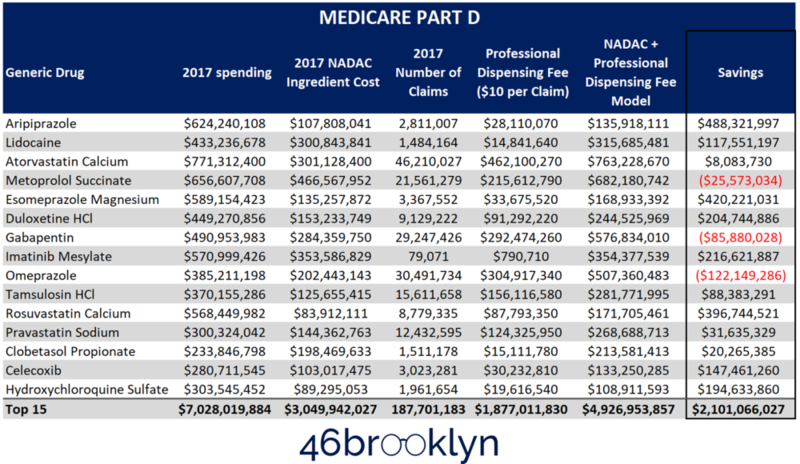 Well, at 46brooklyn, we are no better than the publicly-available data we have available to study, and it turns out that – thanks to the Medicaid Drug Rebate program – Medicaid is where the best publicly-available drug pricing data happens to be. So we worked with this data, identified eye-popping distortions in generic prices from state to state and created visualizations so you could study these on your own and try to make sense of them. We then did our best to explain the root cause of these distortions. “Buy” generic drugs from pharmacies at a price that resembles something closer to the true acquisition cost of the drug. And while every business is entitled to earn a profit, we aren’t exactly choosing between a jar of Goober Face Babyfood and a bottle of Flochman’s Yellow Mustard at the local Mr. Hooper’s. These are prescription drugs. In the context of those who are struggling to afford prescription drugs or the states and employers who are faced with the harsh realities of footing the bill for pharmaceutical care, of course, anyone’s profit and value-proposition in the supply chain can and should be under scrutiny. So, are arbitrary generic drug prices just a Medicaid managed care problem? Not at all. They are a payer contracting problem – a problem that any employer, municipality, state employee program, or Part D plan can have as well. Any payer that is holding a contract that has a PBM generic guarantee based on those three little rotten letters (A. W. P.) is at risk. For all other people, the “your tax dollars are paying for this mess” argument is just not tangible enough. Let’s say we fixed drug pricing in Medicaid. Would taxes actually come down? It’s hard to compel a taxpayer to sit down and read our dense and geeky reports based on this argument. 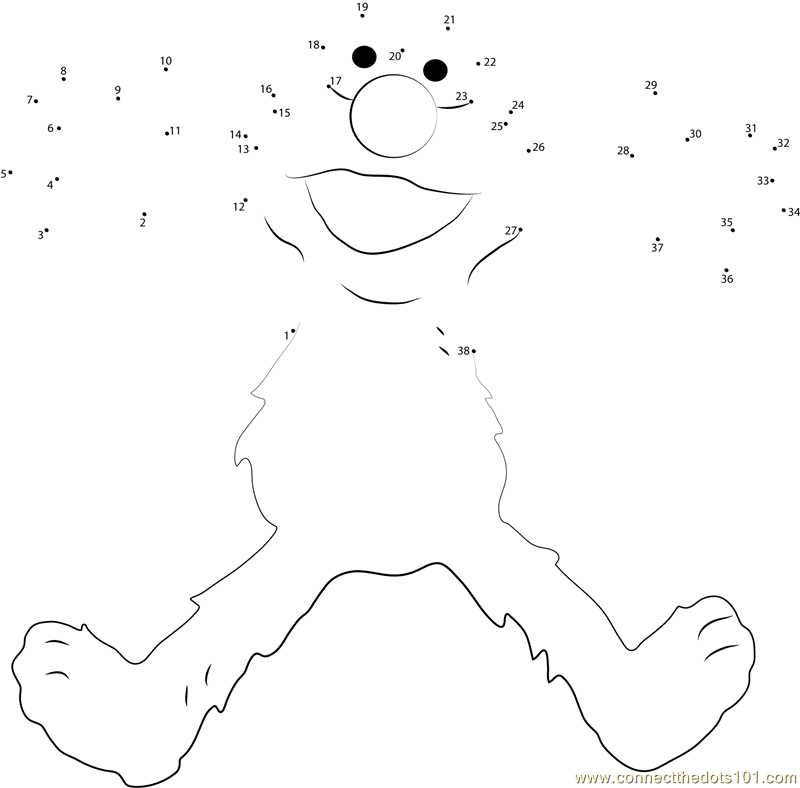 So rather than just leaving you using your imagination to guess what may be happening in non-Medicaid programs, we decided that we should try to do the best we can to help you connect the dots. With all due respect to reporters, academics, and policy wonks (we love you! ), the challenge of diagnosing this problem for the general public is what motivates us at 46brooklyn. And it’s becoming quite clear that we need to venture out beyond our Medicaid roots to make a broader impact. So, to our critics, you are correct; it’s time to go after the blue whale of drug benefits programs. The $150+ billion program with 43 million members and counting, many of which are shelling out significant real dollars for monthly premiums and drug costs. That’s right – Medicare Part D, we’re adventuring your way. So get out your whale-hunting harpoons and brace yourself for a choppy ride as we start our journey into Part D generic drug markup. Before we start our journey into Part D generic drug pricing data, we need to make one point very clear – if deflation in actual generic drug costs is modest, there is nothing mathematically wrong with paying for generic drugs based on Average Wholesale Price (AWP). If there is one thing to remember about a generic drug’s AWP, it’s that it rarely changes - we provided some glimpses of this strange dynamic a few months ago. Long story short, what you need to know is once a manufacturer sets an AWP (or as its been called since this lawsuit, “Suggested Wholesale Price”), it usually stays there. A drug’s AWP is like that box of powdered milk you have in your pantry in case of a crisis. It will last forever. Except instead of helping you survive a crisis, AWP is causing one. Let’s make up some numbers to illustrate this concept. Let’s say Mr. Hooper offers drug coverage for his cheerful, furry store employees, and that Mr. Hooper buys generic drugs based on a contract he has with a PBM. In Year 1, he buys generic drugs with an actual cost of $200 for his employees. Let’s say the AWP of these drugs are set at a completely arbitrary $1,000. Let’s also assume Mr. Hooper knows this, so he asks his PBM for (and gets) an 80% discount to AWP. Mr. Hooper ends up paying $200 for these drugs, exactly what they cost. All is well. Now let’s fast forward to Year 2. Mr. Hooper buys the same exact drugs, and it turns out that there has been no change in the actual cost of those drugs. Well, as we have already established, there has likely been no change to AWP either. Again, Mr. Hooper pays $200, drugs cost $200. All is still well. However, what if the FDA was working very hard to stimulate new generic competition to aggressively bring down the cost of generic drugs (which by the way, is happening)? In this case, let’s assume that the cost of Mr. Hooper’s drugs in Year 2 dropped to $150 (25% deflation). Again, like powdered milk, AWP is unphased by what’s going on outside of the dark pantry in which it sits. So, if Mr. Hooper is still in that same 80% off AWP contract, he will pay $200 for drugs that are now worth $150. All is not well. Before we move on, if you are a payer, we strongly encourage you to study historical AWP trends for your highly utilized generic drugs to fully appreciate how ridiculous it is to accept PBM pricing guarantees based on this number. The more we research this, the more we realize that setting generic drug prices based on AWP is no different than setting generic drug prices based on the population of Denmark, or the number of kangaroos in Australia, or the total number of cookies consumed by Cookie Monster. AWP is closely related to all of these other possible generic drug pricing benchmarks in that each are completely unrelated to the actual cost of a generic drug. To recap, as long as generics are not deflating, if you’re in a contract based on AWP, there’s no problem. But once they start to deflate, you have a problem. That naturally leads to the question – how substantial is generic deflation? Do we have a problem or not? While there are many different studies of generic deflation available out there, we like doing things from scratch, so we constructed our own. To do so, we performed a “stable mix” analysis using Medicaid’s NDC-level drug utilization data, stitched together with each generic drug’s National Average Drug Acquisition Cost (NADAC) price. As an example, to get 2015 generic deflation, we multiplied the number of Medicaid units dispensed in 2014 for each generic drug by its NADAC in 2014, and then summed up all ~2,000 drugs. This gave us the overall 2014 ingredient cost. We then multiplied the same 2014 units by the 2015 NADAC for each drug and summed that up for all generic drugs. Using the same base year utilization with two different prices allowed us to isolate the price impact only. The last step was to calculate the percent difference between the two numbers to arrive at what we call “stable mix” deflation. Figure 1 shows the results of this analysis. As shown in Figure 1, in 2015, generic deflation was a modest 3.6%. As such, any underlying issues paying for generic drugs based on static AWPs likely remained hidden. In 2016, stable mix deflation jumped to 11.4%, a bit higher than we expected, but not all that surprising given the claims of pains experienced by drug wholesalers starting in 2016. But it was 2017 when the generic manufacturer battle royale really took its toll. Medicaid’s stable mix deflation exceeded 16%, and has remained at this level into 2018. As shown in Figure 2, in 2017, nearly four generic drugs decreased in cost for every one that increased, and of those that decreased, more than half fell by more than 10%. Of course, this comes as no surprise to states like Ohio and Kentucky, who each found hundreds of millions of dollars of spread pricing in their Medicaid managed care programs, as PBMs purchased drugs on the cheap from pharmacies (thanks to generic deflation), but sold them to MCOs based on those same old “powdered milk” prices. The data analytics work at 3 Axis Advisors (3AA) has identified similar problems in New York and Illinois as well (note: the co-founders of 46brooklyn also work as consultants for 3AA). But there has been little attention on Medicare Part D so far, at least when it comes to generic drug pricing. To be sure, we deserve some blame for this as we decided not to dedicate too much time to analysis of 2016 data, which is all that was available for Medicare Part D. But this isn’t true anymore. Last week, CMS updated it’s very helpful Drug Spending Dashboard with 2017 Part D spending data. We immediately went to work. Our first order of business was to isolate the generic drugs within the data set. Unfortunately there is no brand/generic flag in CMS’ data. However, CMS does provide both the “Brand Name” and “Generic Name.” Our common sense hack was to flag only those drugs where Brand Name = Generic Name. Voilà, a generic-only Part D list! We then rank ordered this list from high to low for 2016 and set to work studying the top 15 drugs on the list. Figure 3 shows these generic drugs, alongside their total Part D spending and per unit cost in 2016. That’s right – over $7.8 billion in spending on just 15 generic drugs. The first thing that jumps out is the presence of a $1 billion generic drug on this list – Aripiprazole (generic Abilify). This is some serious coin for Part D to spend on a drug that had five different generic labelers (a labeler is the company whose name is the on the bottle/label) hit the market on April 28, 2015, and 11 different labelers by the end of 2015. 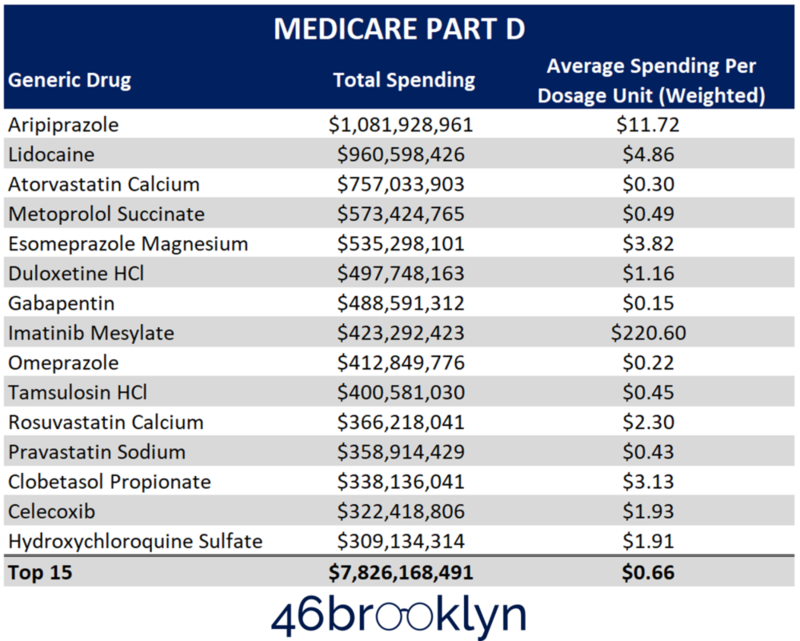 We actually combed through the rest of the Medicare Part D data back to 2013 and only found one other drug in the billion dollar club – Part D spent a whopping $1.3 billion on Duloxetine HCl (another mental health drug) in 2014. This is rarefied air. So that naturally leads to the question of how much this drug really cost in 2016? Were Part D plans and their PBMs collectively serving up a bargain at $11.72 per tablet? Or is this price wildly inflated? Given that CMS is reporting costs aggregated at the ingredient level, we can’t answer this question with 100% accuracy (this is because different drug strengths can carry slightly different costs), but that hasn’t stopped us before, and it won’t now. So we took the straight average of all NADAC prices reported by CMS for all Aripiprazole NDCs over the course of 2016. That number is $4.65 per tablet. Again, this comparison is not completely apples-to-apples, but if Part D was pricing this drug based on its actual cost, the two numbers should have been close. Instead you could drive a Mack truck through this ~$7 per tablet gap (a.k.a. “markup”). Overall, we estimate that of the $1.08 billion in total Part D spend on this drug, only $434 million was for the drug – the remaining $648 million went to the supply chain. Using our math skills, after running the numbers on Aripiprazole, we then added NADAC to the other 14 generic drugs and calculated the markup per claim that Part D plans collectively paid for all 15 drugs in 2016. The results of this analysis are shown in Figure 4. Recall that we consider an “In-Range” markup to be somewhere between $5 and $15 per claim, meaning that the ballpark for a reasonable average markup for the pharmacy and PBM should be roughly between $5 and $15 per prescription. The good news is that six of the top 15 fall in this range. The bad news is that seven are well above the top end of this range, with Aripiprazole leading the pack at a staggering $230 per claim in markup. The weighted average markup across all top 15 generic drugs was nearly $18 per claim. But there is a more perplexing and worrying story here, which starts to raise questions about PBM formulary management. Number four on this list is esomeprazole magnesium (generic Nexium) at $82.53 per capsule in markup. Compare this to omeprazole (generic Prilosec) at $5.55 per capsule in markup. It turns out that these two drugs are actually comprised of the same active ingredient. A quick Google search on these drugs will reveal a litany of opinions regarding Nexium’s relative value, which appears to be modest at best. Against that backdrop, in 2016, Part D somehow collectively valued the act of putting a generic Nexium pill in a bottle to be worth 15 times as much as putting a very similar generic Prilosec pill in a bottle. Recapping so far, in 2016, Part D overspent in what appears to be an arbitrary fashion on some of the most utilized generic drugs in this country. Part D also appears to be paying substantial markups for some drugs, and modest ones for others, creating the incentive to dispense one drug over another. But how is Part D doing in capturing and passing through the benefits of generic deflation to its beneficiaries? To answer this question, we looked at 2017 Part D spending on the top 15 2016 generic drugs. As shown in Figure 5, Part D spending on these 15 generic drugs came down (10%) to just over $7 billion. Weighted average per unit costs came down by an impressive (16%) to $0.56 per unit. Aripiprazole dropped a whopping (43%) to only $6.65 per tablet, shaving over $450 million of expense off of this one drug alone. A 16% rate of deflation sounds pretty impressive… that is until you compare to what happened to actual cost of these same drugs. Figure 6 shows the same 2016 to 2017 comparison in the weighted average Part D cost per unit, right next to each drug’s NADAC in both years. From 2016 to 2017, the true cost of Aripiprazole dropped (75%) to just $1.14 a tablet. The true cost of generic Nexium dropped (67%) to just $0.75 a capsule, yet somehow Part D still paid $3.30 a capsule for this drug. Imatinib Mesylate (generic Gleevec) dropped (45%) to $99.27 per tablet – Part D only saw (11%) savings on the same drug. Overall, the weighted average cost of the top 15 drugs declined by an eye-popping (39%) to just $0.23 per unit. As mentioned earlier, we believe that this generic pricing problem is not unique to any one program; it’s a reflection of payer contract structure. So to the extent that the letters A, W, and P have snuck into contracts in both Part D and Medicaid managed care, we shouldn’t see much a difference between Part D and Medicaid managed care pricing. Let’s bring back Aripiprazole (which by the way, has earned a cameo given that it cost Part D more than $2.5 billion between 2015 and 2017) and put this theory to the test. The below chart shows the comparison of the per unit cost for Aripiprazole in Part D and Medicaid managed care (weighted average across all states), compared to NADAC. Our key takeaway is that these two programs priced this blockbuster generic drug with eerie similarity, and neither were close to the actual cost of the drug. We struggle to envision the odds that Medicaid and Medicare Part D pricing for this drug could be so close without there being similarities in how PBMs are collectively managing the two programs. We’ll leave such complex math to smarter people (or muppets) than us. Drilling down to a drug level, Figure 8 shows what happened to markup per claim in 2017. Generic Gleevec’s markup shot up to more than $2,700 per claim (not surprising given that this drug is one of the poster children for markup in Medicaid managed care). Also notable on the list is Hydroxychloroquine, a drug that cost ~$0.10 per pill in early 2014, experienced a shortage in late-2014 and 2015, recovered from the shortage in 2016 and 2017, but somehow was priced by Part D at a markup of over $100 per claim in 2017. 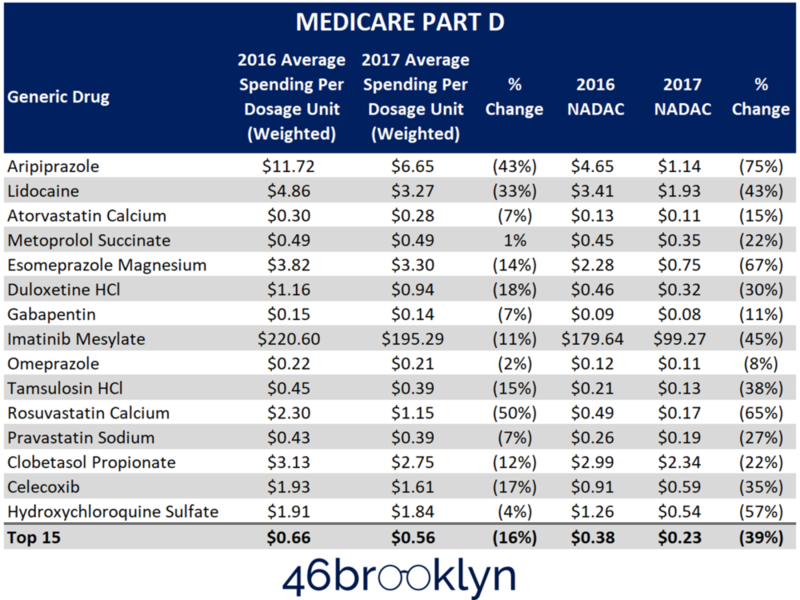 This is fascinating but unsurprising to us, as 46brooklyn’s first report back in August 2018 was on Medicaid pricing distortions on Generic Gleevec, and our second report just 10 days later was on Medicaid pricing distortions on Hydroxychloroquine. Now here we are eight months later seeing the same distortions in Part D. As we already established with Aripiprazole, this is not a coincidence. It’s how the system is designed. So how much is this problem worth? To assess this, we repriced the top 15 drugs using Medicaid’s fee-for-service model, which prices a drug at its NADAC ingredient cost plus a professional dispensing fee that is set based on each state’s surveyed pharmacy operating costs. Here’s an example to help illustrate how this works. Back in Figure 6, we saw that Aripiprazole’s NADAC in 2017 was $1.14 per tablet. Let’s say a pharmacy in our home state of Ohio dispensed a 30-count prescription for this drug in 2017. It would get $34.20 (30 x $1.14) in ingredient cost plus $10.49, for a total revenue of $44.69 for the claim. The $10.49 dispensing fee was set based on an extensive survey of operating costs per prescription – in other words, this is the pharmacy gross margin required to break even after deducting labor, rent, utilities, software expenses, etc. – all of the expenses required to physically operate a pharmacy. So all in, had Part D been in a NADAC plus professional dispensing fee model, Aripiprazole would have cost roughly $45 per prescription. Instead, in Part D’s current arbitrary pricing model, it cost $222 per prescription. We did this analysis for all 15 drugs using a $10 flat professional dispensing fee. As shown in Figure 9, had Part D been in a fee-for-service-style generic pricing model, these 15 drugs would have cost $2.1 billion less. Earlier this year, HHS came out with its proposed ruling to eliminate hidden rebates between manufacturers and PBMs on brand-name drugs. We are huge fans of its goal to reconfigure part of the supply chain to remove the king of all warped incentives: kickbacks disguised as rebates. Health plans, PBMs, and drug manufacturers have had 13 years (Part D came about in 2006) to make the hidden rebate model work, and clearly, they have failed in the court of public opinion. It’s time to try the no-rebate model. At the very least, if net drug costs do not come down, we will for sure know who is responsible (drug manufacturers) rather than continuing to have a tangled web of companies that can conveniently all point fingers at each other while the problem continues to fester. Clearly, there are enormous dollars on the brand drug side of the ledger – $131 billion in spending in 2017 dwarfs the $21 billion spent on generic drugs. So HHS has its priorities straight in tackling brand drug rebates first. But generic drugs play a critical role in bringing overall drug costs down, and the manufacturer market is largely performing this function very well (maybe too well, given quality issues that have surfaced recently). For these savings to not be realized by this country’s single largest payer is very concerning. HHS, if you haven’t already, we highly recommend that you turn at least a bit of your attention to generic drug pricing. Not to get all Oscar the Grouch about it, but the supply chain needs to explain what’s going on here and how this arbitrary pricing model is in the best interest for the federal government and its 43 million Part D beneficiaries. Again, this is not a Medicaid problem. It’s not a Medicare problem. It’s not a commercial problem. It’s a complete market failure, which must be fixed. It’s time to hold this supply chain accountable to work in our best interest.